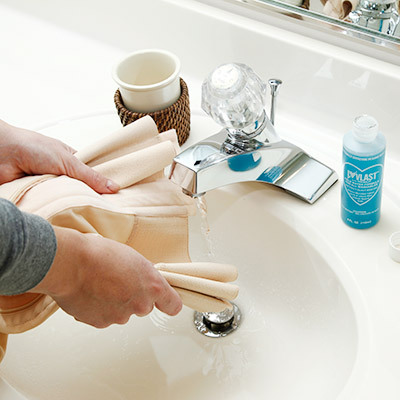 The least damaging way to care for your Compression wear is to hand wash. We recommend that you hand wash your compression garment in lukewarm water with a mild detergent, and then air dry. Please do not dry your garment in a gas or electric dryer, for it may ruin the garment. Drip dry, do not wring out. Delicate or synthetic fabrics tend to dry quite quickly. To remove bloodstains, simply soak your garment in a basin of cool water mixed with a ¼ cup of peroxide. NO! CDI recommend that you hand wash to extend the life of your garment to avoid damage such as straps becoming tangled by the agitator. Can my Compression Wear be tumble dried?